Talk of a looming crisis in social security, whether that crisis is predicted to come to a head in years or decades, has become more and more common. Whether or not the predictions of doom turn out to be true, there is little doubt that social security retirement income is often inadequate. Regardless of whether the future of the system involves catastrophic failure or continuing inadequacy, the sense that there is something wrong with a government system on which so many depend makes it especially important to understand what retirement accounts are all about. Broadly speaking, a private retirement account in the United States is either an Individual Retirement Account (IRA) or an employment-related plan known as a 401(k). IRAs were created in 1974 as part of the Employee Retirement Income Security Act. They were followed by the addition of section 401(k) to the Internal Revenue Code in 1978, which created a mechanism for employers to establish retirement plans that offered them considerably more flexibility and significant cost savings over the traditional “defined benefit” plans that had previously been their only available option. Both types of retirement accounts have evolved since their inception and they are now available in a number of different flavors to suit specific needs and goals. The key feature that distinguishes IRAs from other retirement accounts is that they require absolutely no participation from a taxpayer’s employer. In essence, they allow an individual to contribute cash or cash equivalents to a special account up to certain limits. For individuals up to 49 years of age, the amount cannot exceed $5,000 per year. Individuals over 50 years of age can contribute up to $6,000. The treatment of that special account depends on whether the IRA was set up as a Traditional IRA or a Roth IRA. Traditional IRA. Contributions up to the maximum allowable amount are tax deductible in the year in which they are made. No tax is imposed on earning in the account until distributions begin at retirement age, at which time the distributions are taxed at the normal income tax rate in effect at that time. This mechanism is designed to take advantage of the assumption that the retired taxpayer will be earning less and will therefore be taxed at a lower rate than would have applied previously. Roth IRA. Contribution limits are the same as for a traditional IRA, but those contributions are not deductible in the year in which they are made. Instead, the retiree benefits because distributions are ordinarily completely untaxed after retirement, provided the account has been in existence for at least five years. Two other categories of IRA bear mention. SEP-IRA. The Simplified Employee Pension Individual Retirement Account (SEP-IRA) is a traditional IRA in most respects, but with special features for employers and the self-employed. It allows an employer to contribute up to 25 percent of an employee’s wages to a retirement account subject to limits on the total per-employee contribution that are set annually. For the self-employed, contribution limits are set according to a formula that takes into account net profit less the deduction for self-employment tax, resulting in a limit of approximately 18.6 percent of net profit. SIMPLE IRA. The Savings Incentive Match Plan for Employees can be structured as an IRA or a 401(k), but it almost always uses the former structure because it is easier to administer. It is reserved for employers with 100 employees or less and requires the employer either to contribute up to two percent of employee compensation or to match employee contributions up to three percent of compensation. Employee contributions are subject to age-dependant limitations that change annually. For 2010, employees age 50 and over can contribute $14,000 and employees under age 50 can contribute up to $11,500. While SIMPLE plans benefit employers through simplicity and lower contribution requirements, SIMPLE accounts can have drawbacks for employees. 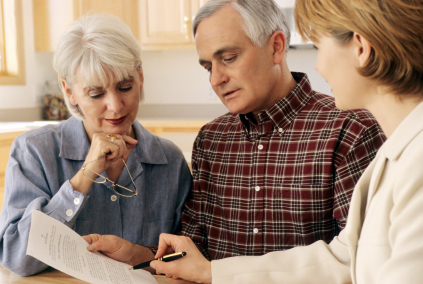 There are restrictions on transferring, or “rolling over,” accounts to a traditional IRA. There are also penalties for distributions made within two years of an employee’s first contribution, and these can be imposed on top of the usual penalties that can apply to distributions made before age 59 ½. 401(k) plans are employer-sponsored plans that allow employees to have a portion of their earnings put directly into a retirement account. Maximum annual contributions are higher than those permitted for IRAs, with limits of $22,000 for employees age 50 and above and $16,500 for younger employees. Employers have the option of contributing to their employees’ 401(k) retirement accounts. In that case, the combined contributions of employer and employee cannot exceed the lesser of $46,000 or 100 percent of the employee’s salary. While the plans themselves are managed by the employer, the vast majority of 401(k) accounts are “self-directed.” Self-directed plans offer employees a menu of investment options from which to choose and employees can reallocate their funds among those options as they see fit and as their needs change. In some respects, 401(k) plans parallel IRAs. For example, they offer the same “traditional” versus “Roth” option. Traditional 401(k). In a traditional plan, the amounts that an employee contributes to the account are not included in taxable income. Taxes on earnings in the account are deferred until money is withdrawn, at which time any gains that have accrued are taxed as ordinary income regardless of whether they would have been capital gains in a non-retirement account. Roth 401(k). As in a Roth IRA, employees can elect to have contributions made on an after-tax basis. Since income tax has already been paid on those contributions, distributions are not taxed if the employee is over age 59 ½ and five years have passed since the initial contribution. In addition to the contribution limits discussed above, some retirement accounts are subject to limitations on the earnings of participants. Traditional and Roth 401(k). There are no limits to the income an employee may earn in order to qualify, provided that the plan does not run afoul of Highly Compensated Employee rules designed to prevent discrimination among employees with different earnings and to avoid favoring business owners. Traditional IRA. Limitations apply based on Modified Adjusted Gross Income, allowing full deductibility for incomes up to $53,000 for an individual and $85,000 for someone who is married and files a joint return. Contributions remain partially deductible for incomes up to $63,000 and $105,000 respectively. Roth IRA. Single taxpayers can make a full contribution for incomes up to $105,000 and a partial contribution for incomes up to $120,000. Limits for married taxpayers are set at $167,000 and $177,000. Additional restrictions come into play with respect to the ability to access retirement funds prior to retirement. IRAs can be tapped for the down payment on a home, for educational expenses and for medical bills, and the regulations are generally more flexible than those governing 401(k) plans. On the other hand, 401(k) plans allow for borrowing from the account if the employer has made provision for this. IRAs offer no such option, but a Roth IRA allows its owner to withdraw the full amount contributed since taxes have already been paid on those contributions.